Possibly the city’s most recognizable landmark, this Catholic church’s steeple and crown grace the city’s skyline and is a featured icon in numerous photos and images that represent the city of Puerto Vallarta. 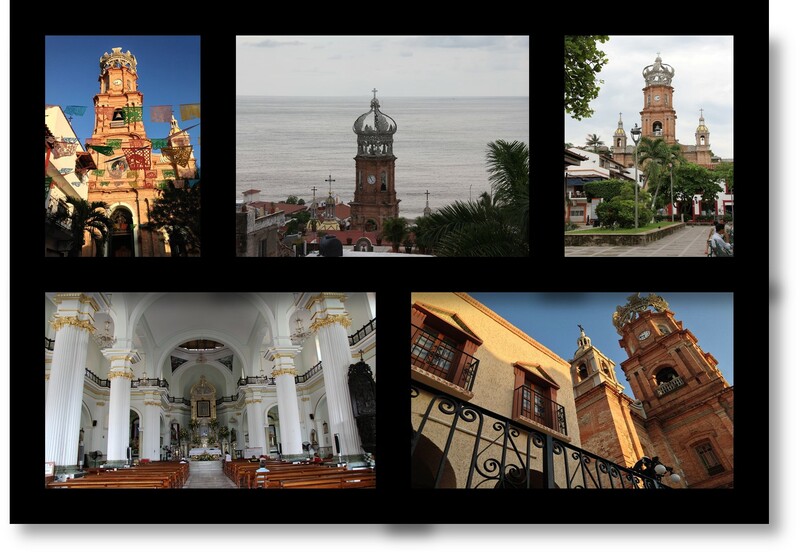 During the 12-day Feast of Guadalupe Festival (December 1 –12) large processions of the faithful from all over the area decend upon Puerto Vallarta. Among the crowds that stream through the streets, singing on their way to the church, are often floats, Mariachis, and Aztec dancers. The festival pays respect to the Virgin Mary who appeared to Juan Diego in Guadalupe. Day and night, vendors are set up around the church selling food, drink and religious items. Year round, there are services in English on Saturdays at 5 p.m. A bilingual mass is held every Sunday at 10 a.m. Church bells are rung 30 minutes and 15 minutes before each service. Respectfully-behaved visitors are always welcome. No flash photography allowed during mass.